Bees can visit 2000 flowers a day in their quest to collect nectar for the hive. bees fly, they pick up a positive electrical charge from the air. An experiment revealed that flowers emit a specific electrical signal that attracts bees when their nectar supply has been regenerated. This explains why I see bees passing by many flowers and landing on the one flower that has recharged its nectar supply. 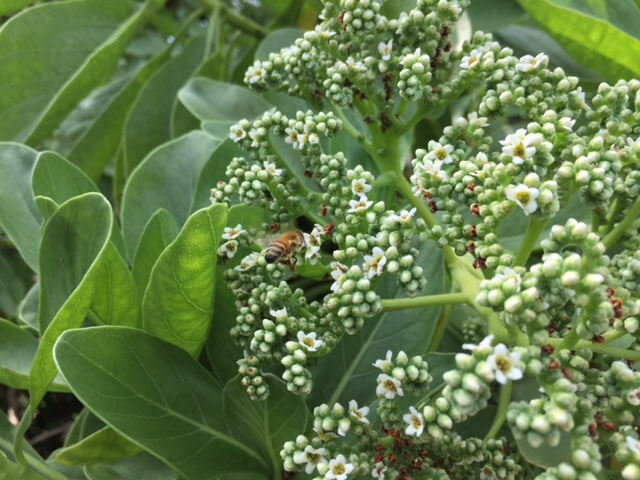 This girl is gathering nectar from a Beach Heliotrope at Manini Beach. She has little balls of beige pollen attached to her legs. In case you didn’t know, sigh…… it’s the girl bees that do all the work in the hive and flying thousands of miles to gather nectar. It’s not that the guys, the drones, don’t do any work at all. Their main job is to mate with the Queen. That’s a lot of work. And then they immediately die.